I have probably read almost all books written about Mahabharata war or based on the epic in the last two years. Then It all became so similar that a break was much needed. While everyone has a different view about the events or uses a different character to revolve the story around , the element of mythology or the beyond reach kind of narration stayed in most books. As much one tried to imagine the characters as human without magical powers or means , it was never perfect for me till I read "The thirteenth Day". This book is funny , feels real , interesting ( I mean it ! ) 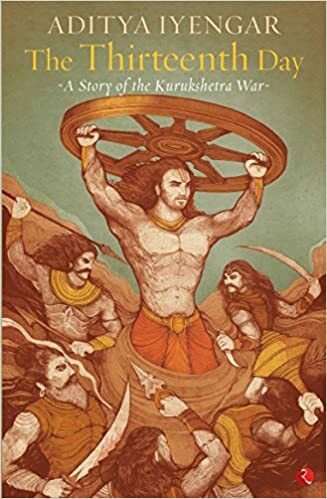 and well written account of the Kurukshetra war , starting from the night of tenth day , after Bhishma has fallen and now lies on a bed of arrows. When Karan visits him later that night , he asks him to take over the throne , he being the eldest Pandava and best friend of Suyodhana. While Karan who is referred as Radheya in the book , is in two minds about this offer , the war intensifies as new strategies are decided each night and the day passes in offense / defense from the battle formations , clash of warriors and the personal agendas of all involved. I always admire war movies for the details of the planning and the execution of the strategy and the tales of each character involved. Aditya has written this book in almost similar fashion. The book is in voices of the main characters , capturing their feelings and unsaid thoughts. The conversations are easy to follow and often with a tinge of humor. The descriptions of the events and the weapons are realistic and rooted to the economical and practical feasibility in those times. I absolutely liked reading Yudhishthira's accounts - the person he is , the person he is supposed to be and the clashes of the two personalities. I returned to reading after a month's break and I could not have had a better one to return to. I am almot sad this ended so soon.